Tinnitus Treatment and Therapy for Meniere’s Disease by the Best Non-Surgical Experts in Malaysia. Call us today! What is the Difference Between Meniere’s and Tinnitus? Tinnitus is a condition best described as a ringing in the ears and can accompany hearing loss in advanced stages. Meniere’s Disease, on the other hand, is the combination of vertigo and tinnitus. In other words, patients with Meniere’s will complain of a loss in balance and ringing like symptoms in the ears. The hearing symptoms in both tinnitus and Meniere’s often present as persistent disturbing sounds. Ringing in the ears is the most commonly described symptom. But, some may report these sounds as escaping air sounds, roaring sounds, running water, buzzing or hammering sounds. Regardless of the type of sound described, both Tinnitus and Meniere’s disease are treatable. Chiropractic Specialty Center® in Kuala Lumpur has the best and most holistic Tinnitus treatment and Meniere’s therapy programs in Malaysia. Our integrative treatment options and technology has succeeded when others failed. Call us today for more information. First and foremost; our clinical teams of chiropractors and physiotherapists offer the best tinnitus treatment program in Malaysia. Secondly, contrary to popular belief, tinnitus is not a disease. The underlying cause of tinnitus can range from a sensorineural disorder in the brain to damage in the inner or middle ear. However, in the vast majority of cases, patients that have presented to us have exhibited a conductive mechanical disorder in the middle; resulting from disorders at the base of skulls, neck or jaws. In addition to the mechanical disorders of the middle ear other causes such as a sensorineural reaction in the brain, sensorineural loss due to an inner ear issue of the inner ear, and harmful effects of medication are a common cause of tinnitus. All in all, there are approximately 200 different health problems, which are either directly or indirectly related to tinnitus. It is important that you know what the common reasons for tinnitus are. In this section of our website, we will familiarize you with the most common disorder linked to tinnitus. If you experience tinnitus, we recommend that you consult one of our research-based clinical chiropractors to assess the structures at the base of your skull, neck, and jaw joint. The vast majority of patients who obtain tinnitus treatment from our clinical teams have noticed significant relief. In fact, some of our patients have reported to us that our Meniere’s and Tinnitus treatment cured the tinnitus they once suffered. Our through assessments and integrative non-invasive methods of corrective care can help correct the most common underlying causes of tinnitus. Prolonged or neglect of the root-cause can lead to hearing loss. Therefore, time is of the essence. Tinnitus and Meniere’s Disease are two of the most common symptoms associated with hearing loss. There are two distinct types of hearing loss, sensorineural hearing loss and conductive hearing loss. 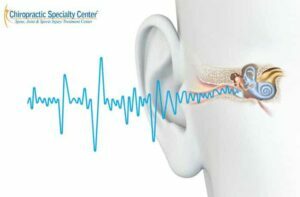 The sensorineural hearing loss results from inner ear damage, while the conductive hearing loss is with disorders or damage to the middle ear. Other types of hearing loss linked to tinnitus are age-related hearing loss and traumatic noise exposure that damage the auditory system. The exact biological correlation between hearing loss and tinnitus is still being researched and studied. The loss of certain frequencies can affect the way the brain processes sound. In other words, with this type of a dysfunction, the brain receives fewer stimuli, it will adapt and change. Tinnitus could be the brain’s way of dealing with the frequencies that it is no longer able to receive through hearing loss. Why Should You Get Treatment for Ringing in the Ears at the Onset of Symptoms? Tinnitus that leads to a hearing loss is often due to an injury, side effects of medication or neglect of a prolonged middle or inner ear disorder. This type of hearing loss can vary with different frequencies. Most patients that suffer from a tinnitus related hearing loss may find difficulty in finding the root cause, as the conventional tests as the tinnitus-related hearing loss may not be clinically measured through the conventional tests. And as such, it is called the hidden hearing loss. The most common sign of a tinnitus related hearing loss is if you have difficulty hearing when there is background noise. Therefore, to avoid such complication, it is advised to avoid neglect of even the minor signs or symptoms of tinnitus. So, accurate diagnosis and timely tinnitus treatment are of utmost importance in avoidance of hearing loss. Pressure can build up in the inner ear when there are blockages in the ear canal, and this will affect the way the eardrum works. If the obstruction of the canal touches the eardrum, it can irritate it and cause the perception of tinnitus or Meniere’s. 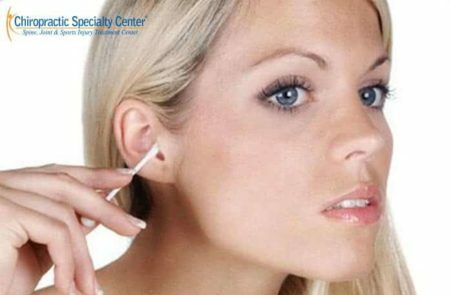 There are common middle ear obstructions such as loose hair from the ear canal, excessive earwax, and dirt of foreign objects. In many of these cases, the removal of the obstruction will alleviate the some of the symptoms. However, there are other situations where the obstruction causes permanent damage to the ear. This will lead to chronic tinnitus. Therefore, our advice to all is to seek tinnitus treatment as the onset of symptoms. Neglect may result in damage or worse, hearing loss. Muscles, nerves, and blood flow problems caused by severe injuries to the head and neck can cause tinnitus. People who have tinnitus linked to head and neck pain or neck trauma will suffer from higher volume tinnitus. They will also have a greater variability in the location of their tinnitus, the actual sound, and the frequency. Tinnitus that is related to TMJ issues (Jaw Pain), as well as head and neck trauma, is often referred to as somatic tinnitus. Temporomandibular joint disorder (jaw pain or TMD) is the cause of another type of somatic tinnitus. This joint is where the lower jaw connects to the skull and is located directly in front of the ear. Any damage to the cartilage, muscles or ligaments of this joint can cause tinnitus. Some of the ligaments and nerve connections in the joint are shared with the structures in the middle ear because of the joint being adjacent to the auditory system. Our clinical teams will thoroughly evaluate your jaws, upper neck back and even base of the skull before we proceed with tinnitus treatment. People who have tinnitus caused by TMJ will often experience pain in their jaw and face. They will also have a limited ability to move their jaw and hear popping sounds when they talk or chew. Our Doctor of Chiropractic is your best hope of having a proper assessment of possible somatic tinnitus causes. Let our expert clinical teams assess your neck, base of skull and jaws to rule out a somatic tinnitus. The somatic tinnitus is the most common and often most neglected forms of tinnitus. Neglect of somatic tinnitus can lead to permanent changes and damage resulting in years of pain and suffering. Visit one of the centers and get evaluated by the best Chiropractors in Malaysia today. The abnormal pressure in the middle ear can be caused by the nasal congestion related to sinus infections as well as colds and flu. This pressure will impact the hearing and can cause tinnitus. Acute barometric trauma is caused by rapid and extreme changes in water and air pressure. This trauma will also damage the middle ear causing tinnitus. There are many potential causes of barometric trauma including diving or snorkeling. Concussive explosive blasts and flying with extreme elevation changes can also cause this injury. If you are a chronic sinus sufferer or one who has been subjected to barometric trauma visit us, we can help. Targeted chiropractic treatments have been found essential for sinusitis patients as well as those subjected to barometric trauma. Chiropractic Specialty Center® has the best chiropractors and physiotherapists for treatment of tinnitus, visit us today. If you believe that tinnitus is a side effect of your medication, you need to consult with the doctor who prescribed it. You should not stop taking your medication without speaking to the physician who prescribed them for you. In many cases, the risks associated with stopping the medication exceed the potential benefits. If you are experiencing tinnitus, it does not mean that you have any of these conditions. It is important that you consult our trained professional today. Our Doctor of Chiropractic is the non-operative expert you need for the best tinnitus treatment in Malaysia. Our methods of tinnitus treatment are through the collaborative efforts of our research-based chiropractors and clinical physiotherapists. So, don’t waste time on ineffective or temporary solutions when you can have holistic tinnitus treatment. Let our clinical integrative teams diagnosis and treat the underlying cause and prepare the best target tinnitus treatment your today. It is not uncommon for a condition to get worse when targeted treatment that addresses the cause is missing. We can help you. I am certain that you also suffer from neck issues as well as neck disorders, and jaw dysfunction. Neglect of jaw disorders and neck issues are the most common causes of tinnitus. Please call our center at 03 2093 1000 for a thorough assessment of your spine and jaws (TMJ). You have office in Shah Alam? Please accept our appology for responding to your request late. I am having Tinnitus with meniere’s disease from past 5 years. I undergone to many doctors treatments but no one cured my issue. Now a days i can’t hear low range sounds. Will this treat for this kind of syndrome. Thank you for posting your question on our site. Tinnitus and Meniere’s Disease are everyday issues that occur in patients suffering from chronic neck and jaw issues. There are times that the neck and jaw issues may go undetected. This holds especially true for jaw disorders. The jaw joint is the only joint in the body that doesn’t have a pain-sensing nerve. So, most that have jaw issues will not experience jaw pain. We need to assess your neck, upper back, and jaws thoroughly. Dr. Yama Zafer is an American doctor of chiropractic with more than 20-years of clinical experience. Please call our main center in Bukit Damansara (Damansara Heights) at 03 2093 1000. We need you to schedule an appointment. Let Dr. Yama assess you first. If there are hidden issues in the neck or jaws, it could the actual cause of the hearing issues you are having. The costs for the initial exam are RM100. Once we have completed the physical examination of your neck, upper back, and jaws; we will be able to provide more information on correcting and stabilizing your hearing issues.